Sent an email and praying for yall bro. If you send us an email, we’ll send you a copy of our letter to Judge Dean. sending emails. Praying for your family. Love your mom like a sister! I’d like to support you. I would just like to know more facts about the case first. Can you provide the details of the judge’s decision? What were her reasons for forcing the change? Please, contact the HSLDA! They have lawyers that defend the rights of homeschoolers every day! Praying for you and your family. ANDREW KOCH!!! I am so sorry this is happening, and I will definitely be praying and I will most certainly write to Ms. Dean! Have you contacted the Texas Homeschool Coalition or the Homeschool Legal Defense Association (HSLDA)? If not you really need to do that. Contacting the Texas Attorney General may help too. THSC cannot proivde the legal aide needed and HSLDA is has not been responsive. Andrew, I too, would like to support you, but would also like to have more facts…..
What about HSLDA or THSC? Please consider seeking their support too. THSC is still working with us and HSLDA is not. I am as a minor only allowed to know what is in that court order that affects me. Texas is very strict about children not knowing what is going on in a divorce hearing. This judge is probably one of the most conservative judges in Texas and it is shocking that from what my mother and many others have said is that this decision when read by a third party looks like a legal vendetta. This judge totally sided with my father the petitioner and gave him everything he asked regardless of the interest of the children and my mothers constitutional rights. Please show your support by writing this judge in the name of liberty. Thank you for your bravery, Andrew! I am praying for you and your family and I just sent a letter to the judge on your behalf. Don’t want to pry, but I stood for my marriage (and many others have as well in cases where the divorce actually went through). Your dad may be prodigal (most likely is to file for divorce in the first place) and God can restore him and the marriage. Take this or leave it – there is absolutely no judgment coming from me, just a referral to pass to your mom….www.rejoicemarriageministries.org. I don’t know if you remember me or not, but I used to teach you and your brothers piano lessons several years ago! I saw a link to this blog post on Facebook today and was so sorry to read of all that has happened to your family in recent years. I was also very impressed by the excellence of this writing you have composed and the obvious heart you have to protect your family’s constitutional rights. I wrote the judge just now, vouching for the homeschooling efforts I saw firsthand when I would come to your house in Katy for piano lessons. I do hope she changes her mind, however, it is good to know you are resting in God’s plan, whatever it may be. Please know my prayers are with you! You don’t know me, but I saw the link to your blog post via a friend. I’ve taken action and written Judge Dean an email. I pray God will direct her in her decision to support you and your family. Continue to stand strong in the Lord! Reading about the decision didn’t just upset me, it angered me. The email has been sent and prayers are being said. My email has been sent. I am asking my friends and family to send an email also. I wanted you to know that I am praying for you and your family as well as for the judge as she makes her final decision. Your piece was extremely well written and touched my heart. God bless you and your family as you face this adversity. I have written letter and am praying for y’all!!!! Andrew – you don’t know me, but a couple of my friends posted the link to this on Facebook. I’m a homeschooler as well, so I sent an email to the judge. I also have met Dr. Mike Farris (very involved with the HSLDA), so I sent him a message to make sure that you are not being overlooked. I will let you know if I hear anything from him. Andrew, you may not remember me – but we used to do homeschool group together in WI. I am praying for you and your family and I will be writing a letter to the judge. Keep being strong in the Lord and in the power of His might! We have a hurting family that will have the home school rights taken away if we do not do something about it. I ask you to prayfully consider how you can help this family. Maurya came to North Belt for a little while and went to one Fourth of July Celebration. That is where I got to know her better. I got to visit her and her adorable children at their home in Katy. I went to the children’s rooms and the home schooling room. The children have the best homeschool mom there can be. I wish I was as good as Maurya is. She is not a great home schooling mom but very loving to her children. She is very organized and educated as well. She has done a wonderful job homeschooling her children. As she moved to San Antonio with the kids, we have kept in touch. The children and Maurya love San Antonio and their new church. They have found the homeschool support up there they need. They love it there. They also come to see the father on the weekends. They do not mind the drive. David the father was in the ALERT group with North Belt for a while. AC got to visit with him a while. You can call AC and he will tell you his opinion as well as the other men in the ALERT group. The oldest son. Andrew is one of the brightest young men I know. His mom has done an absolutely marvelous job with him. He is not only bright but very respectable and proper young man. As a matter of fact, I was just asking Maurya what material she uses for public speaking. Her children communicate very well. The situation now is explained in Andrew’s Blog. By the way, God has used Andrew’s blog to inspire my children to stand for what they believe…(Standing for the unborn- we go to pray to the abortion clinics.) to do great things for the Lord! I know the reason Andrew is the way he is is because God has used his mother to influence him in doing what is right during the time she home schools him.. The attorney Judge Sheri Y. Dean is a republican but is taking home schooling rights away! Wow! I will surely tell her about that. Republicans should be for family and values. Those children have the mom only now at home and she wants to take them away from her. She did not ask for a divorce. It was forced upon her. Please take the time and read this- pray about it and if you write a letter please send it before June 12th. This breaks my heart! It is too much. Please feel free to send this to your friends. Please pray for this family as they are in the middle of being torn apart! May God keep the children with their loving mother. Start a petition on Change.org! Please don’t wait. I will gladly pass it around on my FB page. What reason did THSC give for not taking the case? Sent the email & praying for your family . I do believe this is a reminder to all home school families that the cost to join HSLDA is minimal compared to the help they can be. If you are members, I pray HSLDA responds soon. May God intervene in this case for the best future for all of you. We home schooled part of our children’s school years and I’m partial to that option 🙂 However, I also have lived out God’s carrying us through situations that we do not like and would not choose. Looking back, God has used those circumstances, too, for His glory. He will be with you, guide, direct, and sustain you. Yes, definitely contact this organization: http://www.hslda.org/ – very sorry to learn of this. 😦 Hang in there. Just as a note. HSLDA in their info packet sent to me it states on line J, “HSLDA does not provide legal representation for members in matters involving divorce, child custody, or related to domestic disputes.” So they are not just not responding to you. It is written in their policy. Praying you get this worked out. Andrew – I heard back from Mike Farris and he said that the HSLDA very rarely gets involved in divorce cases, especially if the parents are members, in which case there would be a conflict of interest. I’ve asked if he knows of any other organization that might be able to help your family and will let you know what he says. Please contact HSLDA right away, if you have not already. http://www.hslda.org This is what they do. I have sent my email, and shared this with my friends on facebook, who will HOPEFULLY share this with their friends, and so on. I will be praying for your family! HSLDA does not participate in divorce hearings. Ever. They have consistently turned down any pleas in cases like this. Feel free to check that info…it’s all over the internet. I tend to need more information before taking action. However, I was homeschooled. My email has been sent. I truly hope that the information provided wasn’t misleading in any way. My heart goes out to you and your family. Please keep us posted! HSLDA does NOT assist parents in matters of divorce. They only help in matters of parent vs state. If the father is petitioning the court to go against homeschooling (as many fathers do simply to destroy the mother/child relationship after he’s already caused a stink of divorce) then it’s up to the judge and more often than not, they side with public schooling simply because it is a more politically correct choice. HSLDA does nothing to help in these matters. There are more cases of divorce that needs HSLDA’s help but they don’t interfere. Only parent vs state cases. I sent an email and posted this on Facebook. Praying for you and your family. I truly wish people would stop promoting HSLDA in matters such as this. They DO NOT help in matters of divorce when a parent is petitioning to destroy the family (usually mother and children) by his actions. Judges often choose the politically correct public schooling decision because they are community figures and don’t want to “stir the pot”. HSLDA ONLY assists in matters of parent vs state and in so many families where divorce is the catalyst for tearing the family away from homeschooling, HSLDA will not be able to help. No matter how much you donate to their organization, they stand behind their decision not to assist in these matters. Please do not give false information where others who are in desperate situations may be given false hope. HSDLA will not be involved in the case of divorce. Even for members. I just sent an e-mail. Are you guys connected with THSC??? Praying for your Family, just sent my email. sent an email!! praying for you family! GOd BLess!!! Have you tried contacting Senator Ted Cruz to see if he can help in any way? Sent an email and will share your story. We will keep your family in our prayers. God is bigger!! I’ve written the judge. Praying for your family, this has got to be so difficult for you all. I sent an email to the judge. I live in Harris Co., so I let her know that I would be voting according to the decision that she makes in this case. Homeschool freedom is very important to me. I will be praying for your family. Thank you for standing up for your mother and siblings. I just sent the email to the judge and am sharing this on Facebook. I’m a homeschooling mom and am hoping and praying the judge reconsiders. i was homeschooled and home school my kiddos as well. We will send a letter. i asked my husband about HSLDA (we are members). He said you have to be a member, then he remembered they will not involve themselves in domestic cases like that. We had to fight my daughter’s father over home schooling. We are praying for ya’ll that no matter what the out come you will have God’s peace. How will your family have income? I was thinking it makes sense for you to go to public school so your mom can work. That is the reality of divorce. I am sorry you don’t want to go to school but maybe God has a bigger plan and needs you to be a blessing to someone at a public school. I couldn’t get the link to work. I tried sending an email. it said format is wrong. I am praying for you and your family. But does that mean we should stand up for whats right? Constitutional liberty is at stake. Yes, God has a bigger plan but we have responsibility to stand for truth. Regardless of what happens at least we did the right thing. Sent an email & will pray for your family. You are clearly a levelheaded & articulate young man. Surely, this is evidence enough that your mother has done a good job of educating you. Only by the blood of Christ. Adriana, I think you left out the word “ONLY” where you say “she is not a great homeschooling mom” !! 🙂 Nicely written. letter sent, email sent, message shared with others. still praying. I saw this on FB and I have a question for you. You want to be home schooled, but you are being forced to move in with your father who does not want to home school you, so the judge is ordering that you go to public school? Yes, the judge is requiring us to attend public school and having my father who is not the custodial parent the right to enroll them. My prayers are for the Koch family, homeschooling is safer in my eyes. Parents don’t have to worry if the child will be kidnapped, shot, or even bullied. As long as the child gets a good education it should never matter where they get it or who is teaching them. I lost my son at 18 for being bullied and other reasons but no child should have to miss treated or always have to look over their shoulder because of fear. I hope and pray that you win this fight. We are so sorry for you loss. Thank you for allowing this to motivate you to help others. “Be strong and courageous, do not be afraid or tremble at them, for the LORD your God is the one who goes with you. He will not fail you or forsake you.” Have faith that His purpose will prevail, even if it means you must go to public school… and hopefully you will not. Teach your younger siblings to memorize scripture, that will be your power and shield. I sent an email. But I would recommend creating a petition on change.org for a greater possibility of widespread support. They have had many successes at convincing governmental authorities how much is at stake when they overstep their bounds. Tia and others who think a parent cannot both bring in an income and homeschool as well- YOU ARE WRONG! And to deny your support of this family’s choice based on that ridiculous assumption as well as post that snarky comment… I have no more nice words for that. Just… HUSH! Andrew – I am so sorry to read about what your family is going through. I think it’s great that you have started an e-mail campaign to build support for your cause. If I can offer another possible path… In Florida we have something called a Guardian Ad Litem generically speaking it is an attorney or an advocate that represents ONLY the children’s interest. In almost every state a child of your age (17) should have some legal say in the choices being made. I would highly recommend you look into hiring an advocate to speak on your behalf. You should also be allowed to file something (not sure what the word is) with the court directly expressing your wishes and asking the judge to consider them. I pray you and your family find the strength and support you need during this turbulent time. May God bless your efforts, Andrew. The Lord is with you. If you are in SA you could go to legal aide and petition for a lawyer to represent the children in this matter. Seems like the children need a voice of there own. so sorry to hear of your dilemma. I have grandchildren who are home schooled and they are very bright and I would put up the 1st grader up against any 4th grader without a doubt…unfortunately Texas is notorious for ” you scratch my back and I’ll scratch yours” dealings in courtrooms among the judicial system.. I’m assuming your dad must know someone…Try getting the media involved it may help to pressure the judge or get the venue changed here maybe you can get your chance here they don’t like this kind of exposure because then they have to explain the decision which is so much different from others in a similar situation. May the Lord bless you and open doors for you. I suspect the dad is demanding this to keep his support payments to a minimum. Knew another family with a messy divorce, and that was the real cause for that guy. Keeping up a family in another city homeschooled so the ex can’t take a full time job makes that divorce very expensive for the dad. Of course, he made a really bad move. Doubt his family will have anything to do with him in the future without lots of rancor no matter what the judge finally decides. With you being 17, I assume you are a Junior in highschool. I’m not clear on the laws for homeschooling in Texas as I am in NC, but are you not able to go ahead and graduate on the books. Doesn’t mean that you have to stop adding to what you are learning before you apply to college. I am not sure what the ages of the kids kids are but it would very unwise to at least out you into public school the last of your highschool. If you are like my son we have already completed the requirements to get into college before the age of 18. Just something to think about. Just wrote to her! Best of luck to your entire family. I sent an email to the judge and signed your petition on change.org. Best of luck to you & your family, Andrew! David Koch vs. Maurya Koch. You have denied Maurya Koch’s Constitutional right to homeschool and you have told the family they must move back to Houston. Maurya Koch has committed NO crime and yet is being treated as if she has. It will be harmful and unfair to the children to uproot them and force them to go to a school system they have never been in or want to be in. It has already devastated the children and their mother. PLEASE change your decision for the sake of the children!!! *I live in Harris County, and I VOTE… I will NOT vote for your re-election and will encourage others to do the same, IF you choose not to change your decision! Our family has your family in our prayers. As fellow homeschoolers, we refuse to allow our children in the public school system. God’s blessings to you! single parents can and do home school. home education is flexible and each family can tailor it to meet the needs of each child as well as the family’s lifestyle. I would think this judge would consider the children’s desires as well as the father’s former approval of home schooling. Andrew is obviously a successful, joyful young man. God’s blessings to you, your mother, and siblings. While not ideal, don’t forget that online public schools are also an option. 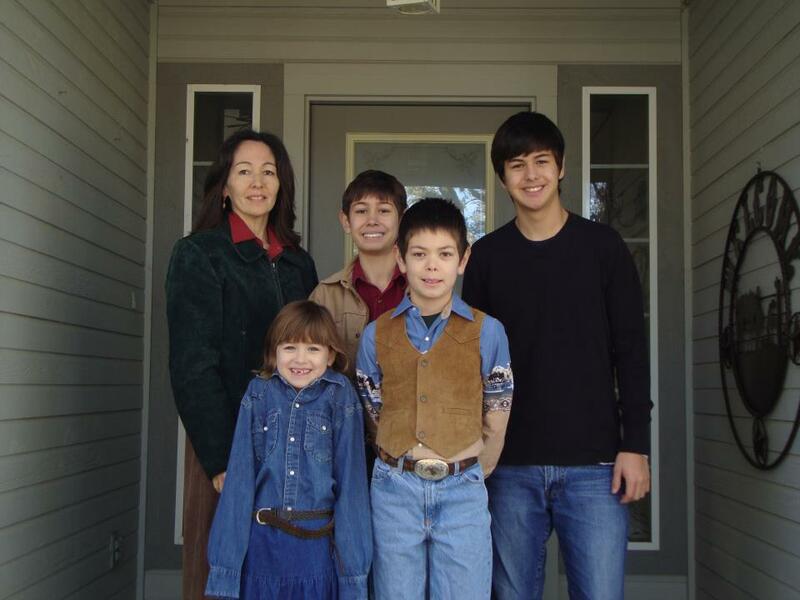 Certainly a hardship and not really homeschooling, but at least the family would still be together… praying for you! All battles are not won on the battlefield! I will add my voice. Bravo! I really don’t understand how the judge can order where someone lives.. I can somewhat understand why they would order public school if the other parent didn’t agree with homeschooling, BUT if this is something that has always been a lifestyle for this family, then there is no way to justify this decision what so ever.. This is certainly a violation of constitutional rights.. The fact that a judge can decide someones lifestyle and take the ability to make important life decisions for a law abiding citizen is absolutely sickening.. We need to stand up and say NO MORE!!! I’m praying for this family and that the Judges decision will be over turned.. Remember though, that God is in control.. And Sometimes the way we think things should go isn’t always the same as how he does.. He knows better than we do.. Bless you all and keep your faith.. Although it would not help your siblings have you considered getting your GED and seeking emancipation. Texas state law has some pretty clear cut laws regarding it. Contact an attorney or even legal aid and see what they can do for you and your brothers. It is not difficult for a mother to both homeschool AND work either from home or away. Additionally if she works from home, the children can be involved as much as they wish in her efforts to support the family. Say what you will, this is not about whether a family should or should not homeschool- a decision the state and society should have NO say in that matter. This case is about whether a MAN who abandoned his family should have ANY say in where they live or how they are educated. I say he should NOT! maybe it’s time they did. just a thought. I have seen this happen to 5 families here in Wilmington, NC. The same judge has taken away the right to homeschool each time,yet it is our right to homeschool in NC. The judge has told every attorney in town, that he hates homeschooling and if you come to his court concerning homeschooling he will rule against it. I am so sorry this is happening to your family. These judges need to be stopped. Keep up the good work dude. I was homeschooled. I respect you. You should contact HSLDA- they WILL help you!! I lost my right to homeschool. My ex husband claimed he didn’t think homeschooling was working and the judge forced me to put my 3 boys, ages 14, 12, and 11, into public school in February. It was devastating. Court is next Wed to revisit this and the judge will decide whether to force the boys to go to a different school district (the boys’ dad is requesting this) or keep them where they are. I don’t get to homeschool again. I’m praying this doesn’t happen to you. Also, HSLDA will NOT help with custody situations. I homeschooled my children for 3 years as a single mom and worked and supported myself with no help from the father. It is possible and not hard at all. Dear Andrew, I wrote a very long letter as I was once one of those children in a situation like yours. I have been homeschooling for 24 years. I hope my small ‘book’ helps. I wish I could do more. I will be praying daily for your situation. Signed the petition and email Judge Dean on your behalf. Best wishes to your and your family! Sent an email to the judge and signed your petition, Andrew. What a courageous young man you are and such a positive role model for your younger siblings! God bless your family! I pray boldly before the throne that your mother will be victorious and that the Lord will be glorified! Petition signed and email sent. I also shared it on Facebook for my homeschooling friends to see, and I will be praying for you all, including your dad. I sent an email to Judge Dean and will keep all of you in my prayers. Wow…. I understand the rage and confusion in this article, but this isn’t about homeschooler rights; this is about parental rights in a divorce proceeding. I’m really scared in which the young Andrew mentions the divorce as “my father turning from God’s will” and the other various rhetoric– unknown to his innocent/ignorant mind this blog post could very well be used in his father’s defense as proof of a parental alienation by the mother. Of course there are 2 sides to every story, but airing ‘dirty laundry’ like this will NOT get him what he needs. Perhaps the opposite. Also, this minor does not have “The right” or any right to be homeschooled. No, not at all. THE PARENTS have the right to homeschool their minors. If there is dissent on how the child should be raised/school- that is for the judge to decide (she did), and no minor rights are being violated, and definitely not any “constitutional right”. Lastly, as Andrew admits, this DIVORCE proceeding is decision is still sealed- we know not what the judge used to determine her ruling. By his own admission, this is a family-friendly-strong judge, and I would trust the FULL scope of evidence is what is best for the children. I’ll pray they don’t alienate their father further, and come to see that the good Lord provides, often for the better, against our will. Peace would be the best prayer for this family right now. I will write the judge that I prayerfully support her leadership and to not be strong-armed by those not knowing the full nature of the case, instead, reacting to the strong emotion that a hurt child brings. These, after all…. are still children, and will be taken care of as such. 1 Cor 13:11-12 When I was a child, I talked like a child, I thought like a child, I reasoned like a child. When I became a man, I put the ways of childhood behind me. 12 For now we see only a reflection as in a mirror; then we shall see face to face. Now I know in part; then I shall know fully…. A letter that shows a supporter of home schooling who doesn’t know the difference between ‘applaud’ and ‘appalled’ is probably not going to convince the judge that home schooling somehow provides a superior education. Andrew was the first child, so he got the most attention. Four kids to tend to and working full-time, how is Maurya supposed to do a competent job? Homeschooling is a luxury, not an entitlement! And let us never forget, there are 2 sides to every story. Email sent. Praying for your family. Home School Legal Defense needs to be contacted immediately. It is an awesome organization, and this is exactly the kind of battles they work on. I emailed, and added my own “two cents” at the end. I do pray that your situation resolves happily. Please give your dear, brave mom my love. Don’t worry about the comments that aren’t so positive. It’s hard for people who haven’t been through this to understand. Also, remember that no matter what happens, God is in control and will work this out for your growth and good. Please give your mom my blog address (click on my name). My husband left when my children were very small, and I’ve managed to homeschool all the way through. My oldest son is your age, and getting ready for college in the fall! You’ll be OK; God will not let you down. Really? You are going to pick apart someone because they misspelled a word? Nice. I don’t think the judge is going to give a crap about a word being incorrectly spelled, when she sees that the author of the letter is a registered voter. Do you have kids in public school? If so, do you seriously believe that the public school system does a “competent job” of educating and caring for all the children? By the way, homeschooling is a ENTITLEMENT. There is no luxury about it. It doesn’t matter how many sides to a story there is. This story has one side. The freedom to home school your children. Plain and simple. As many people including the writer noted, HSDLA will not touch this because it involves a divorce case. Homeschooling is actually a right. Read the constitution. I guess they don’t teach that in public school anymore. I’m sorry you’re going through a difficult time, but no good judge is going to decide what’s best for a family’s children based on emails from complete strangers. I would guess, however, that posting her email address and encouraging mass emails is going to tick her off, and if anything make her even less sympathetic to your case. The best way to get the judge on your side is probably to go to school, do amazing work, and prove that you’ve been well educated up to this point. If you do that, perhaps she’ll reconsider the custody and schooling arrangement. Sure, it’s a right IF you can afford it. If you have enough income to support staying home to teach your kids, go for it! I doubt many single parents can meet all the needs of 4 children, work full time and be responsible for their education. Yes, my kids are in public school, I teach in public high school, and our school just turned out plenty of top scholars in the class of 2013 with fine character. We have character ed every week, still say the pledge, and have a moment of silence each day. Our students are exposed to the ‘real world’ and learn how to deal with it, without having to be sheltered. They learn to stick to their values without being corrupted. I have nothing against home schooling other than people who think that in a case of divorce, one parent (usually the father) should have to break his back working for years while basically going broke trying to pay for the other parent to stay home on the grounds that home schooling is an absolute necessity. Kids are resilient. They may be afraid, but they WILL adjust. If she has raised them to have good values and character, they will do just fine. As a recent graduate of FSU, I am trained and ready to serve in the public education system. However, I am appalled that your rights are being trampled. I have sent an email to the judge. Some “Good Men” will stand and keep on standing!! They never get involved in a case involving divorce. That doesn’t mean we should ignore this, however. Twice we’ve had fathers in our churches file for divorce for no reason given at all (one being an unemployed drunk caught with another woman, the other a borderline-illegal emotionally abusive type), and then went on to spend extraordinary amounts of time and energy over several years to try to split the children from the mothers. To me, these are the saddest cases of all. If the children say they want to stay with the mother, the judge should listen to them. HSLDA does not help in cases that involve divorce, no matter what. That’s why this boy has had to turn to us on the internet to try to make the judge reconsider her actions against him and his siblings. The HSLDA does not get involved in any case that involves a divorce, which is a real shame when the children are completely vouching for the mother and the father is just being vindictive. It is likely that the judge has her blinders on if her preference is for a broken public school system even though the children seem to be doing far above average where they are. Judges are elected public servants, not overlords, and are expected to get feedback from the public they serve! It’s outrageous for a judge to order a family back to a city they moved away from just to force to a public school, especially when they are academically far ahead of their public school peers, show no signs of abuse or neglect, and are universally in favor of staying with the mother where they are. To suggest the idea that you should passively go along with a judges decision because she MAY change her mind later is absurd. To beat down a boy fighting for his mother and family by saying it may “tick [the judge] off,” you should stop and consider what kind of message that sends. Let the judge deal with a little extra email and let the family be in peace in the town they’re in. You, sir, took the scripture COMPLETELY out of context to apply it to this situation. That scripture does not refer in any way to something of this nature, but I won’t go there.This IS about the rights of a homeschooler – A divorce and a decision to homeschool your child are TWO DIFFERENT things. If it were just pertaining to where they lived, and the judge ruled that they must live closer to the father, even if it wasn’t ideal – I could possibly see that. But to tell a woman that she HAS to put her child in the public school system is ridiculous! If the father doens’t want to have to pay extra to cover homeschooling costs, and the judge thinks that is a fair request (seeing as how it is now the mother’s decision, solely) – so be it. I am more than certain God can take care of the needs – I have seen Him provide many times over for homeschooling parents to be able to take care of the educational needs of their children. But to deny her the right – that is garbage. She neither feeds, clothes, or cares for them daily, and apparently – neither does the father anymore. She has NO right to decide for the mother what she must do – she is out of line. I have sat in Judge Deans court more times than I can count and can say from first hand knowledge and experience that she is not a “family-friendly-strong judge”. That is why she is the most appealed judge in Houston history. No good judge should over-step her boundaries and try to make a decision that is not hers to make. Where they live – I can see that. How much money the father should have to pay – sure. How they are schooled? NO. Not when there is clear evidence that they are very well taken care of and taught. Unfortunately, too many judges think that they have arrived in a position where theiir personal opinion can filter into their legal decisions, and it shouldn’t be that way. And I say that, knowing that can go both ways! I believe maybe the emails and response from the public could make the judge take a second to re-think what she is doing. If she only gets angrier, well – she won’t change regardless – but no one should give up easily. Done (letter sent and prayed for). Have you contacted HSLDA? Well done young man! Keep seeking and standing! attend public school. I have been homeschooling my own children for 22 years. We have enjoyed lots of field trips, hands on learning and more focused training on my children’s strengths and weaknesses due to the reduced student teacher ratio. I pray that you would see homeschooling as a pursuit by parents who want to have a more active role in their children’s education because they put them as a priority in their lives. I myself have a degree in Computer Science but gladly put that career aside to spend quality time with my children. My children have thrived apart from the cookie cutter school system. They learned to diligently do their school work, peacefully interact with their siblings, dutifully do their house chores, and respectfully obey parental orders. I ask you to consider allowing Maurya Koch to submit letters of recommendation so as to ease your conscience regarding the children’s best interest. Divorce is a terrible thing for both parties but the children should not have to suffer the upheaval of the home they have established in San Antonio with their mother. May the Lord steer your heart to judge in favor of Maurya to continue homeschool her children. Praying for your family. Also, sent an email to the judge. Very heartbreaking. I believe Jeremiah 29:11 for you! ATTORNEY HELP: Andrew Koch: This is the only way I could think of to reach you: Tom Sanders, attorney, Maurya-call him immediately if she still needs a lawyer. He said this needs to be handled asap and should be able to get it done, but needs more information asap. I sent an email. I will be praying. God Bless you! It seems that Mom needs to bring this matter before an appellate court. We’ll be praying! I wrote and email and promoted it on a FB page. Praying for you! Just sent my personal note to Judge Sheri Y. Dean on your behalf. It’s easy to marginalize problems that we are so far removed from, but I heartily took your concern to Yahweh in prayer. Be encouraged and remain faithful! Shalom! I fought the state of Texas in the eighty’s to home school and won!!! Praying for you and your family! I can also send you a copy of the email I sent the judge if you would like. Send me your contact info. We will know later today. I am shocked that this really can happen in the land of freedom? Another over stretch of a governmental official as usual. I will keep this family in my thoughts and wondering if there is any more news on this as of yet? Really Ann Johnson, REALLY? You have more sympathy for the father’s financial situation than you do for the children? You “have nothing against home schooling” REALLY? So when you said “Our students are exposed to the ‘real world’ and learn how to deal with it, without having to be sheltered” you were NOT saying that homeschooled children are not exposed to the real world? You were NOT saying that homeschooled children are sheltered? Your ignorance about homeschooling is evident. Your bias is evident as well. Who are you to say these kids will adjust? Especially after having the father abandon the family? Do you know them personally? Because you are a gov’t employee does that make you all knowing and wise? You are a perfect example of what a lot of homeschoolers do not like about the public school system… the “We know better than you what is best for your family” attitude. What a joke. A divorce and decision to homeschool are not two different things if there is parental dissent on how their children should be raised. If the children were with the Father and he wanted to homeschool them and the mother did not…? Then what? There is no decision of this solely being the mother’s- I’m astonished you made that conclusion. The father is not dead- this is a divorce proceeding- he just in disagreeance to what he thinks is best for his children. To deny her the ‘right’ is ridiculous, but not to deny any fatherly rights? There is also a question of when they fled Houston to San Ant– if the mother fled with the children, then she could be facing difficulty for removing the children unlawfully. I think you forget who the judge is- an intermediary, to find a middle ground of both parents. Don’t get mad at this: the judge has EVERY right of the LAW to decide what actions are to be carried out by the parents. Us, as Christians, have to learn to live in the world we are in. Whether we want to belive it or not, there are certain authorities and methods that will control our lives– again, whether we admit it or not. Romans 13:1 Let every person be subject to the governing authorities. For there is no authority except by God’s appointment, and the authorities that exist have been instituted by God. 13:2 So the person who resists such authority resists the ordinance of God, and those who resist will incur judgment 13:3 (for rulers cause no fear for good conduct but for bad). Do you desire not to fear authority? Do good and you will receive its commendation, 13:4 for it is God’s servant for your good. But if you do wrong, be in fear, for it does not bear the sword in vain. It is God’s servant to administer retribution on the wrongdoer. 13:5 Therefore it is necessary to be in subjection, not only because of the wrath of the authorities but also because of your conscience. After reading this response, I believe the previous scripture stands (1Cor). Just because we think of one aspect of life being “more Christian” than another (or the mother is “better/more godly than the father”), doesn’t always mean it is right– time to stop reasoning like a child and see the whole, not the part, the big picture. (Which was admitted by Andrew of not having all the facts as the court would not release them due to the minors). We are forgetting the judge is the intermediary: trying to find a middle ground among the parents and what is best for the children. You are hung-up on schooling; this case is about parental rights and the disagreement on the method of schooling. She isn’t being anti-homeschooling; she is finding that middle ground based on the parents’ requests. Be careful of conjecture and heated rhetoric here! Lets be careful using the terms “Constitutional Right” as that term is loose, and circumstantially dependent. Homeschooling is more a States’ right than a Federal right. As for the circumstances: if this family was being told they couldn’t homeschool because the state preferred you didn’t then you would have a huge issue. The circumstance is a divorce case and one parent wanting to homeschool and the other in disagreeance. A decision is made to levy the claims based on the rights of parents over their minors. Whether that makes us angry or not, this isn’t an anti-homeschool statement. Be careful to not get caught up in the heat of the moment! Pray for peace and that these fine children will be cared for greatly and God’s hand to guide the decisions, even if they seem not to be what we want. If only it were this simple! If only we could be sure both parents are simply trying to do what they feel is best for the kids. Having seen divorce close up, it seems likely to me that it’s a case of a hostile parent who has abandoned his responsibility and now is projecting his guilt on the parent who’s trying to keep things stable for the kids. I’ve seen this before. However, we know that whatever happens, the children are in God’s hands. Public school isn’t the end of everything. Faith can thrive anywhere. I have been wondering how the case was settled – have been praying! Is there a current update? I am not out looking for an argument. My hang up is not on homeschooling itself, although I am a full supporter of such, If that gives me a bias opinion toward homeschooling, then so be it. Obviously the mother has custody of the children,in which case it should be 100% her right to make the decision on their educational needs. I can honestly fully understand an order to move, if that is necessary to meet said ‘middle ground’ between the adults, although I may not like it for their case – uprooting from where children and a family are happy and settled isn’t easy, especially not if it could cause added tension living closer to the father. But I could understand that. The decision to not allow her to homeschool, however is an infringement on her as their mother and sole care giver. I know they see the father, but if they are with her most of the time, she should be able to make that decision. And, as much as I am not a fan of public school, I would say the same were the situation to be flipped and she desire to put them in a public school while their father wanted something different. I believe it should be the decision of the main custodial parent, and from the sounds of the case, she has been just that. Larry, it is your logic that is low. And you ARE taking these scriptures out of contex, especially Romans 13. This judge is an elected offical, she only has authority by the vote of the people. Our gov’t is run differently than that of Rome, eh? Isn’t it the people who have the authority in this country? We elect our leaders do we not? Using your reasoning we should never make an effort to change anything at anytime in this country. That is absurd. This mother so far HAS followed the dictates of this judge. Are you saying she or her child should never express a dissenting veiwpoint and try to effect change because that is “resisting authority’? Have you considered that the father has allowed his wife to homeschool until now? Did you notice that Andrew described his upbringing as “somewhat Christian”? You do know that the judge APPROVED this family’s move to SA, right? There was no “fleeing”. Is it too late to write to the judge? No it is not, I would focus though if you do to say that we should still be able to live in San Antonio. Yes, I know enough about the situation to be able to make the statements I made. And I have just as much justification to say that the children will adjust as YOU think you do to say that they can’t or won’t. I expect I have witnessed a lot more kids make these types of adjustments than you have in your sheltered world (jk re: “sheltered”). I’m sure if you were the one going broke you would not feel so strongly about someone else staying home on your dime. Say what you want, but to imply that Christians can’t have success and be well-adjusted in a public school system…then some damage must’ve already been done to the children. I have seen plenty of devout Christian children make this transition VERY successfully and come out of high school with scholarship opportunities while maintaining the good character their parents raised them with. I’ve seen kids whose parents have done a wonderful job homeschooling as well as those who should be arrested when their kids can’t even write their names as third graders. The point is there is no reason the children can’t do well in public schools. Did it ever cross your mind that Christian children could be more evangelical in high school than in already-Christian-dominated groups? I’m afraid that you may be the ignorant one in your thinking. Don’t be so narrow-minded. Looks like the judge is up for re-election in March 2014 primary’s does she have a stance on homeschooling? She now says she supports it because Tim Lambert and 4,000 people scared her. Ann Johnson, I am confused by your response to my post. You are arguing against points I never made. Who were you arguing with? Did I say or even imply that the Koch children can’t or won’t adjust? NO. Did I say or imply that Christians can’t “have success and be well adjusted in a public school system”? Umm… NO. Did I say or imply that I live in a “sheltered” homeschool world? Nope. I was public schooled from K-12. Why not argue against my actual points instead of a phantom post that doesn’t exist? The fact is you were rude in your initial post making fun of a misspelled word that was probably auto-corrected by a spell checker. You then proceeded to take the side of a man who has left his family, a man who is very obviously causing his children emotional trauma beyond his leaving, a man you probably do not even know personally; all the while making prejudiced comments about homeschoolers being “sheltered” or implying they aren’t exposed to the “real world”. Or even better, the mom can’t “competently” educate her four kids and work. I am wondering how many children you are able educate each day in your job. Is your behavior the type that is taught in the character ed that is available at your public high school? I noticed how you so easily dismissed Andrew’s obviously excellent education by saying he was the first and therefore got the “most attention”. Yes, I’m SURE that’s it. I was calling out your hypocrisy in saying you “have nothing against home schooling” – because it’s obvious by your words that you do. AND I was making the point that for some reason or other you seem to think you know what is best for this family, these children. These children who do not belong to you, whom you do not love, nor I presume, know. Who is narrow minded indeed? Yes, Judge Julie, I am sure you are just right about everything. You have walked in everyone’s shoes, and YOU know what’s best for the children, YOU know who I am. YOU sound pretty argumentative yourself there, Missy. Good job missing all MY points. I don’t have anything against homeschooling when the parent(s) can do a good job and can afford it financially. The point is, unless you live in a really rough part of town, public school is a viable option that is not going to damage well-adjusted Christian children. Sorry if you don’t like that. There’s nothing more to say. Now, do try to relax some and be a good Christian. I will pray for you. I think everyone needs to take a chill pill and remember. That we are talking about people’s lives. That none of you know much about. If I could speak to tell you the whole truth. Some of you would be singing a different tune. What has transpired since your last post? Andrew, I am a friend of your mother’s from college days. I also home school. Have you all contacted Home School Legal Defense for help? Normally you need to be a member but not always and sometimes you can become a member in order to get help. If you all have not, call them to see what they say. They have represented folks like you and your mother for years and have won most of their cases. P.O. Box 3000 • Purcellville, VA 20134-9000 • Phone: 540-338-5600 • Fax: 540-338-2733 , hslda.org. Please tell your mom Bella and Kathleen have been looking for a way to contact her. We are praying and will help in anyway we can. Poor Texans. And Texans wonder why they are considered one of the most backwards of all states, as well as having the educational statistics back it up? Homeschooling is part of that vacuum, as is religion. But I suppose every country needs it’s trash…to make the non-trash easy to see. Why is Texas one the few states that’s booming economically? Is it because they are backward? And as to homeschooling, why do top universities want homeschool students? Judge Sheri Dean is running re-election campaign. With so many people supporting you, please give back to those who were silenced by threats of jail or maternal deprivation and speak up for them. Judge Sheri Dean commits numerous acts of violence against children and their mothers by handing their safety, freedoms, and dignity back to their abusers. In the process of the so-called justice, judge Sheri Dean doles out amicus appointments to her cronies and intentionally delays the cases to enrich her buddy attorney. Judge Sheri Dean does not stop there!! She puts the family and children in an endless cycle of parening facilitation, coordination, mediation so that money pilfering does not stop there. Senator Cruz must stop this money hungry immoral two faced woman who hides behind Tea Party principles.